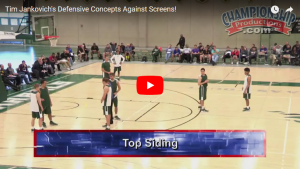 This defense technique for defending a wide pin down screen is with SMU Coach Tim Jankovich. The video is hosted on You Tube. The video is two minutes and 33 seconds long. He discusses the position of the ball as to when they deploy this technique.